FREE water bottle with any order in August and September! The New Mexico State University (NMSU) study of western saddle fit is now available at the link below. This study utilized a computer pressure pad to precisely evaluate over 200 horse saddle combinations. Highlights of the study included the revelation that over 84% of roping and barrel saddles tested were bridging. Also approximately 50% have excessive pressures over 3.6 psi, which can damage back tissue,caused by improper fit and associated reduced surface area contact of the bars to horse’s back. 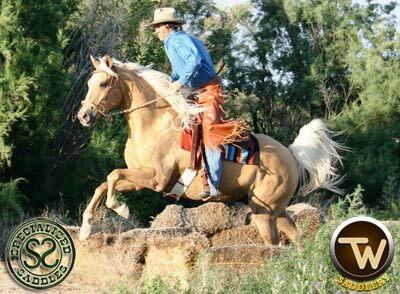 Bridging is usually caused by the saddle not being wide enough, to fit both the horse and padding being used. To learn more about the relationship of padding see “The Pad Paradox‘. One day David Kaden, owner of Specialized and TW Saddles, attended a NMSU scanning session with some TW western saddles, and refit eight horses who had very bad scans with their traditional western saddles. Using his adjustable saddles, the students rescanned these eight, and seven of them or 87% changed from bad to good scans when fitted with the new adjustable western saddles. The other horse, was too wide to fit the standard tree on the TW Saddles David brought. He said his extra wide model, which was out on demo, would have accommodated the very wide horse, making it 100% perfect saddle fit on problem horses. But 87% was pretty remarkable improvement. Because a TW or Specialized Saddle has the padding BUILT INTO the saddle and width is adjustable bridging is not a common problem and is easily fixed if it exists. For the second time in past 12 months Specialized Saddles has moved into larger quarters. WE are pleased to announce our continued growth has necessitated a new home. Larger space is helpful for everyone, and we are increasing our production. Thanks to all our customers who waited, and are waiting, for their new Specialized or TW Saddle.We know your saddle will be worth the wait but we do recognize the frustration of a delayed delivery and we are working hard to improve deliveries. Check out the growing TW line at TW Saddlery and be sure and look at the videos HERE and new video testimonials also on the specialized site HERE. Also our entire “Features and Models” DVD, and “Fitting the Specialized Saddle” dvd are now on our site in chapters, with new improved digital resolution. Look for more videos online on our site soon.